Regular breeding resident and migrant; occasionally a rail is spotted during the winter months in the Twin Cities metropolitan area. The Virginia Rail was an uncommon species during the Minnesota Breeding Bird Atlas (MNBBA). Found throughout most of southern Canada and the northern United States, where it extends as far south as New England in the east, the Great Lakes in the Midwest, and west to California, northern New Mexico, and Arizona. The Virginia Rail is sparsely distributed throughout its breeding range (Figure 1). Ranked a species of Moderate Concern by the North American Waterbird Conservation Plan, with a Continental Concern Score of 9/20 assigned by Partners in Flight; designated a Species in Greatest Conservation Need by the Minnesota Department of Natural Resources. Short- to medium-distance migrant wintering along the southern coast of the United States and in northern Mexico. Probes mud and shallow waters to feed on aquatic invertebrates, small fish, frogs, and aquatic plants. Woven platform and overhanging canopy; depending on the nest’s height, a small ramp also may be constructed. Several dummy nests are built that may serve as sites for feeding, resting, and brooding the young. Breeding distribution and relative abundance of the Virginia Rail in North America based on the federal Breeding Bird Survey, 2011–2015 (Sauer et al. 2017). As early as 1892, Dr. Hatch considered the Virginia Rail to be “generally distributed across the country” where suitable wetlands were present. Roberts (1932) also described the species as a statewide summer resident, noting that it wasn’t nearly as abundant as the Sora, with which it shared its nesting habitat. Although the Virginia Rail’s distribution was presumed to be widespread, nesting records for this secretive marshland species were scant and limited to just five counties in the southern, central, and western regions of the state: Hennepin, Isanti, Jackson, Kittson, and Polk Counties. In the following years, nesting reports accumulated from scattered sites throughout the state, including locations in Cass, Otter Tail, and Sherburne Counties. The first confirmed nesting report in northeastern Minnesota was an observation of three nests in a wetland community on Minnesota Point in Duluth (Hero 1938). When Green and Janssen (1975) wrote their updated account of the species’ status, the Virginia Rail had been documented breeding as far north as the city of Virginia in St. Louis County but was not found further east in Lake or Cook Counties. It also was considered scarce in the far northern counties of north-central Minnesota. Several years later, Janssen (1987) reported the first breeding record from northern Lake County. The species, however, remained uncommon throughout most of the forested regions of the state. Where nesting had been confirmed, 21 counties were delineated since 1970. By 1998, Hertzel and Janssen added another 3 counties to the list, all within the species’ primary range, which excluded Cook, Lake, and northern regions of St. Louis and Koochiching Counties. As of 2016, field biologists with the Minnesota Biological Survey have recorded a total of 145 breeding season locations for the Virginia Rail, including 2 in Cook County. The bird was largely absent from southeastern Minnesota except in the Weaver Bottoms region of the Mississippi River. It also was absent from large portions of east-central Minnesota and from the heavily cultivated Red River valley and upper Minnesota River valley (Minnesota Department of Natural Resources 2016). During the MNBBA, observers tallied a total of 377 Virginia Rail records from 6.5% (307/4,758) of the surveyed atlas blocks and from 6.2% (146/2,337) of the priority blocks. Breeding evidence was confirmed in only 14 blocks (Figures 2 and 3; Table 1). The birds were observed in 70 of Minnesota’s 87 counties and were confirmed breeding in 12 counties. Seven counties were additions to the list Hertzel and Janssen published in 1998: Blue Earth, Carver, Chisago, Clay, Meeker, Sherburne, and Washington. Overall, the species was sparsely and irregularly distributed throughout the state, with pockets of high abundance in a number of localities, most notably in west-central Minnesota. The species’ distribution has not noticeably changed in the past 100 years. Roberts (1932) presumed the Virginia Rail was found statewide, but it wasn’t until the later years of the twentieth century that his supposition was proven true. Although nesting has yet to be confirmed in Cook County, the species’ presence during the summer months certainly is a strong indication that nesting is probable. It is unlikely that these recent records in northeastern Minnesota represent a range expansion. Rather, they likely are the result of more intensive inventory efforts. Other atlas efforts in the upper Midwest, including Canada, have noted that the species’ distribution remained the same between atlases and appeared unchanged from historical accounts (Cadman et al. 2007; Chartier et al. 2013; Rodewald et al. 2016). Little is known about many aspects of the species’ life history. A two-year study of the Virginia Rail and the Sora conducted in the early 1950s in Ramsey County remains one of the most cited works in North America on both species (Pospichal and Marshall 1954). Equally important work was conducted on both species by Kaufmann in the 1960s in Iowa and Minnesota (Kaufmann 1971, 1977, 1983, 1987, 1988, 1989). Breeding distribution of the Virginia Rail in Minnesota based on the Breeding Bird Atlas (2009 – 2013). Summary statistics of observations by breeding status category for the Virginia Rail in Minnesota based on all blocks (each 5 km x 5 km) surveyed during the Breeding Bird Atlas (2009-2013). Summary statistics for the Virginia Rail observations by breeding status category for all blocks and priority blocks (each 5 km x 5 km) surveyed during the Minnesota Breeding Bird Atlas (2009-2013). The Virginia Rail is predominantly an inhabitant of freshwater wetlands during the breeding season (Figure 4). During the winter, however, the species is found occasionally in brackish wetlands along the coasts (Conway 1995; Zimmerman et al. 2002). Wet meadows, fens, impoundments, and shorelines of lakes, rivers, and streams may be used if sufficient emergent cover is available. The most important features of suitable habitats are shallow water (0–15 cm deep), dense emergent cover, and muddy substrates with a plentiful supply of aquatic invertebrates (Conway and Eddleman 1994). Patches of dense cover (30%–70%) need to be interspersed with open water and mud flats. Floating residual vegetation or live water lilies are often present and provide an additional surface for foraging, particularly in portions of the wetland that have deeper water. Although dense cover is important, older wetlands choked with emergents are usually avoided because movement through them is too difficult; wetlands with younger growth are preferred. Occupied wetlands range in size from less than 1 ha to larger than 20 ha (Zimmerman et al. 2002). Compared with the Sora’s habitat, the Virginia Rail generally occupies drier areas of a wetland (Conway 1995). Later in the season it is not uncommon to see the Virginia Rail feeding in adjacent uplands and/or moving to deeper, more permanent wetlands as the smaller, shallower wetlands become dry (Zimmerman et al. 2002). Typical breeding habitat of the Virginia Rail in Minnesota (©Lee A. Pfannmuller). Given its reclusive habits, the Virginia Rail is extremely difficult to monitor. As a result, population estimates are not available. The Upper Mississippi River & Great Lakes Region Joint Venture is the only area where biologists have attempted to establish a rough population estimate using data from state breeding bird atlases, state bird books, and local experts. Stretching from the eastern half of Minnesota south to eastern Kansas and east through Michigan and northern Ohio, waterbird biologists estimated a population of approximately 3,600 breeding adults in the Joint Venture region (Soulliere et al. 2007). Although data on the Virginia Rail have been collected by the federal Breeding Bird Survey (BBS) since 1966, the survey is not a robust tool for monitoring population trends. Virginia Rail detections are so low that these data have low credibility in every state, province, and bird conservation region in the United States and southern Canada. Indeed, the relative abundance of the Virginia Rail on a given route throughout the entire survey area is nearly zero (0.02) birds per route per year; this compares with a relative abundance of approximately one bird per route for the Sora (Sauer et al. 2017). Despite its lack of statistical rigor, the BBS data suggest a long-term increasing population trend (Sauer et al. 2017). Another source of monitoring data available for the Virginia Rail comes from the Great Lakes Marsh Monitoring Program, coordinated by Bird Studies Canada (Tozer 2013). Begun in 1995, the binational program surveys marsh birds and frogs at more than 5,000 locations in the Great Lakes Basin. 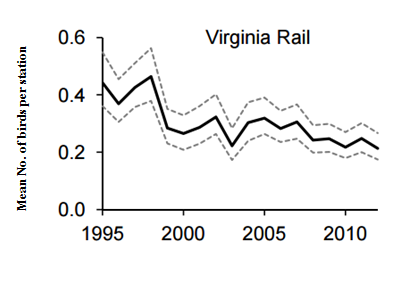 From 1995 until 2012, rails monitored by the survey demonstrated a statistically significant decline of 3.7% per year (Figure 5). Loss of wetlands, coupled with environmental stress on those coastal wetlands that remain, are believed to be the primary factors responsible for the decline. Virginia Rail Abundance on the Great Lakes Marsh Monitoring Program, 1995-2012 (Tozer 2013). The North American Waterbird Conservation Plan (2006) has designated the Virginia Rail a species of Moderate Concern, due largely to threats to its wetland habitats, both on the breeding and wintering grounds. It is rated slightly lower than the Sora, a species of High Concern. At the time of the assessment, the Sora’s population appeared to be declining, while what little data was available suggested the Virginia Rail had a stable population. The Virginia Rail has been assigned a Continental Concern Score of 9/20 by Partners in Flight (2017). The Virginia Rail is not state-listed but is designated a Species in Greatest Conservation Need in Minnesota (Minnesota Department of Natural Resources 2015). A harvested species, the Virginia Rails is legally hunted in 37 states, including Minnesota, and in Ontario (Conway and Eddleman 1994). Hunting pressure in the Midwest is considered minimal, with most birds taken incidentally to other targeted species. There is no national survey that provides annual statistics on the number of Virginia Rail hunters or on the number of birds harvested (Conway and Eddleman 1994). Minnesota is one of the few states that has a harvest survey, and even that survey lumps all rails, except the American Coot, together in its report. During the 2015–2016 Minnesota hunting season, the estimated number of hunters harvesting the Virginia Rail, the Sora, and the Common Gallinule was only 445. The estimated harvest per active hunter was 2.3 rails, for a total estimated harvest of only 1,023 birds (Dexter 2016). The Sora likely makes up the majority of birds harvested. Nationally, the estimated number of hunters is also considered quite low. Specific management recommendations for the Virginia Rail focus on the protection and restoration of wetland basins that are diverse and provide a mix of emergent cover, shallow water, and muddy foraging substrates. Wetlands where the emergent cover has become too dense for rails need to be periodically disturbed by burning, mowing, plowing, or periodic drawdowns to set back succession and restimulate the aquatic invertebrate community (Zimmerman et al. 2002). Aggressive efforts to accelerate wetland protection and restoration in Minnesota should pay dividends to the Virginia Rail. Greater attention to the needs of all wetland species during management efforts is also important. Warming temperatures could also pose challenges to the rail’s wetland habitats. In 2010, the Virginia Rail was ranked having a low vulnerability to climate change (North American Bird Conservation Initiative 2010), but that ranking may not accurately reflect the problems to which all wetland-dependent species are exposed, especially in the northern Great Plains. Increased drought conditions, coupled with more extreme rainfall events, could severely impact wetland species in a region that depends on stable water levels during the breeding season. These and other challenges increase the importance of being able to accurately monitor population trends. One of the most significant impediments to rail management and conservation, however, is the lack of solid population data. Many states have recently launched statewide marsh monitoring programs to address this need. Beginning in the 2016 field season, Minnesota joined these efforts (Audubon Minnesota 2016). Unlike the BBS, the National Marsh Bird Monitoring Program uses playback calls to solicit more responses for its survey. With more data in hand, we may begin to better understand the status of this uncommon wetland inhabitant that makes its presence known more often by its unmistakable Kid-ick, kid-ick call than by offering us a rare glance. Hero, Casimir. 1938. “Marsh Bird Community Study: A Preliminary Ecological Investigation of the Minnesota Point Sand-fill.” Flicker 10(3/4): 1–3. Kaufmann, Gerald W. 1971. “Behavior and Ecology of the Sora (Porzana aquatica) and Virginia Rail (Rallus limicola).” PhD diss., University of Minnesota. Kaufmann, Gerald W. 1977. “Breeding Requirements of the Virginia Rail and the Sora in Captivity.” Avicultural Magazine 83: 135–141. Kaufmann, Gerald W. 1983. “Displays and Vocalizations of the Sora and the Virginia Rail.” Wilson Bulletin 95: 42–59. Kaufmann, Gerald W. 1987. “Growth and Development of Sora and Virginia Rail Chicks.” Wilson Bulletin 99: 432–440. Kaufmann, Gerald W. 1988. “Social Preening in Soras and in Virginia Rails.” Loon 60: 59–63. Kaufmann, Gerald W. 1989. “Breeding Ecology of the Sora, Porzana carolina, and the Virginia Rail, Rallus limicola. Canadian Field Naturalist 3: 270–282.